the influence exerted by carbon dioxide on the oxygen dissociation curve of blood, that is, the curve is shifted to the right, which means an apparent reduction in the affinity of hemoglobin for oxygen. Compare: Haldane effect. the effect of CO2 and H+ on the affinity of hemoglobin for molecular O2. Increasing PCO2 and H+ decrease oxyhemoglobin saturation, whereas decreasing concentrations have the opposite effect. In humans a decrease of pH from 7.4 to 7.3 at 40 mm Hg PO2 decreases oxyhemoglobin saturation by 6%. The Bohr effect is particularly significant in the capillaries of working muscles and the myocardium and in maternal and fetal exchange vessels of the placenta. The reduction in haemoglobin affinity for O2 caused by a reduction in pH resulting from addition of protons (H+) or CO2 to blood. The product of H+ concentration on the affinity of hemoglobin for oxygen. As the H+ concentration increases, the oxygen affinity decreases, causing a release of more oxygen to the tissue. One of the most important buffer systems in the body. a phenomenon named after its discoverer, the Danish physiologist Christian Bohr (1855–1911), who showed that the oxygen-carrying capacity of blood HAEMOGLOBIN varies with PH. At high pH values haemoglobin has a high affinity for oxygen, but more acid conditions cause haemoglobin to release its oxygen, as in tissues with a high concentration of dissolved carbon dioxide. See OXYGEN DISSOCIATION CURVE. Bohr effect - the influence exerted by carbon dioxide on the oxygen dissociation curve of blood. Bohr equation - an equation to calculate respiratory dead space. 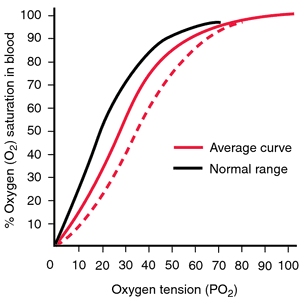 describes a shift of the oxyhaemoglobin dissociation curve to the right, due to an increase in acidity, carbon dioxide tension and/or temperature of the blood; these reduce the percentage saturation of haemoglobin with oxygen, and hence the amount of oxygen carried per litre of blood, at any given oxygen tension. displacement of the oxyhemoglobin dissociation curve by a change in carbon dioxide tension. As with the Bohr effect, the progressive mismatch between the pH range of maximum cooperativity and the actual blood pH suggests that cooperativ ity becomes less important in oxygen transport at lower temperatures. Furthermore, the Bohr effect is reduced and the pH-insensitive oxygen reserve rises during cooling, suggesting that pH sensitivity falls in the cold.